It’s a snowy weekend in my corner of Southern Ontario, which is not particularly unusual; it is the month of December. The north-eastern U.S. has also gotten hammered with winter weather, but that’s also not that unusual. However, Cairo is covered in snow? And so is Israel? That is a bit strange. I am not a meteorologist, so I won’t draw any conclusions, other than the obvious: doesn’t look like global warming to me. If it hasn’t snowed in Cairo in 100 years, this does not appear to be a sign of warming, but I’m not an expert, so disregard my comments on the matter. 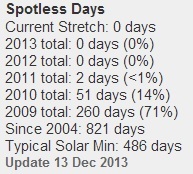 In 2009 there were 260 spotless days, then only 51 in 2010, only 2 in 2011, and for the last two years, no spotless days. And it’s snowing in Cairo. But if a sunspot is a cool area on the sun, and there are lots of sunspots, shouldn’t the sun be emitting more heat, not less? I just said I’m not a meteorologist, and you are asking me these questions? What do you expect me to say? That sunspots occur in pairs as magnetic disturbances in the convective plasma near the Sun’s surface. Magnetic field lines emerge from one sunspot and re-enter at the other spot. Also, there are more sunspots during periods of increased magnetic activity. At that time more highly charged particles are emitted from the solar surface, and the Sun emits more UV and visible radiation. (Okay, I didn’t say that, this guy did). My point is this: the biggest source of energy impacting the earth, by a wide margin, is our sun. If sunspots lead to magnetic disturbances on the sun that reduce the sun’s energy output, it is plausible to assume that during periods of high sunspot activity, the earth would cool. Is this a crazy theory? NASA doesn’t think so, and they use as an example the Maunder Minimum, the period from 1645 to 1715 when there was less solar activity, leading to a “Little Ice Age”. It is possible that if there is less heat coming from the Big Ball of Fire in the sky, the earth will cool. The sun operates on predictable patterns, warming and cooling. It could be that we are in a cooling period, which is why it’s snowing in Cairo. I realize that it is not politically correct to say that the sun impacts life on earth, totally outside of our control. We should all agree that humans are the sole cause of global warming, or, now that the earth is cooling, “climate change”. I am no fan of pollution, and I agree we should keep our greenhouse gas production to a minimum, but we should also acknowledge that the sun impacts our climate. Which could be why it’s snowing in Cairo, and I will get to spend some quality time with the new snow shovel I just purchased. But enough of that. On to the important numbers. Year to date the DOW is up 20.23%, and the S&P 500 is up 24.48%. Gold, and the TSX Venture exchange, are both down in excess of 26%, although gold did eke out a small 0.73% gain this week. So what’s the correlation between the markets, the price of gold, and snow? None that I can see. What I do see, I hope, is a bottom in gold, hopefully around the $1,210 level, or perhaps the $1,180 level touched briefly, intra-day, in July. 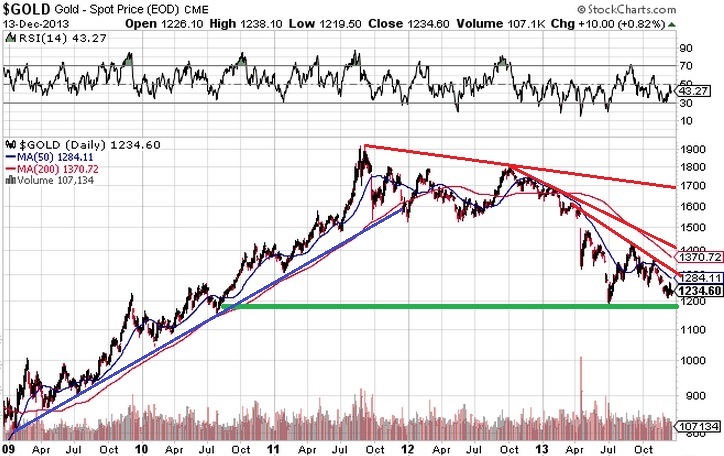 If we breach the $1,180 level, gold could keep dropping. If not, the bottom may very well be in, which represents a great buying opportunity. My strategy, as elaborated on these pages previously, is to liquidate any stock that doesn’t have the cash and prospects to weather the storm (figuratively speaking). I’m holding the quality stocks, and placing stink bids to increase my holdings on big down days. Finally, I do covered writes each month on my blue chips, to reduce my cost base each month, which helps mitigate my losses. This year, no. Not even close. But, I’m not a day trader, and I am confident that economic fundamentals will eventually re-assert themselves, and we will be off to the races again.